When Margo Georgiadis, CEO of Mattel (at left), and Wendi Heinzelman, dean of the Hajim School of Engineering and Applied Sciences, sat down for a fireside chat during Meliora weekend, the topics ranged from the staggering underrepresentation of women in computer science, to how both the toymaker and the University are using emerging technologies to interest young people in science and engineering. Read a full transcript here. The leader of the world’s largest toy maker says it’s “unacceptable” that more than half the population is not represented in creating the computer-driven technologies that will fundamentally change the world during the next 20 years. 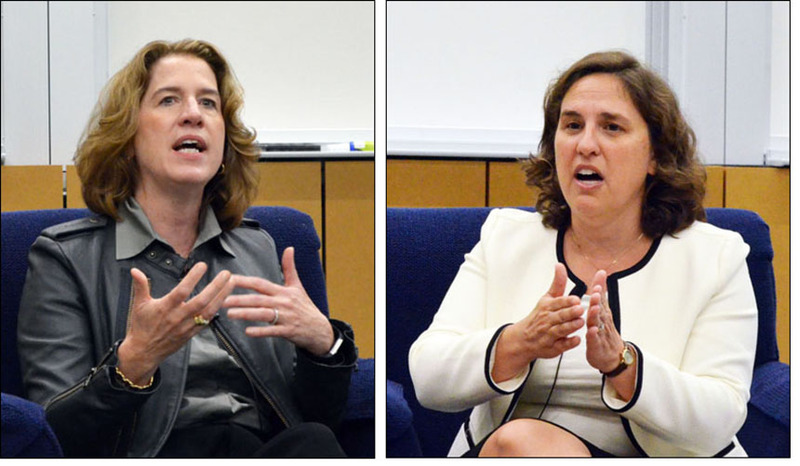 Speaking at the University of Rochester, Mattel CEO Margo Georgiadis cited the “staggering” underrepresentation of women and minorities in computer science. “We have half as many women graduating with degrees in computer science as we did 30 years ago,” Georgiadis said in a fireside chat with engineering dean Wendi Heinzelman during the University’s recent Meliora Weekend festivities. “Seventy-four percent of girls in middle school express strong interest in science and computer science, but by the time they leave high school, only 0.04 percent of girls are interested in majoring in computer science. Georgiadis, a former senior executive at Google, suggested three ways parents and educators can help address the problem. 1. Encourage young girls to think of themselves as creators as much as consumers. “Girls are all over Snapchat and Instagram,” Georgiadis said. Talk to them about how these technologies are changing their world, and how they can become part of the revolution by coming up with their own ideas to make these technologies better. 2. Give them opportunities at an early age to explore computer science and what coding is capable of doing. Much of the fireside chat revolved around the roles that both the toymaker and the University can play in inspiring the next generation of leaders in a world being transformed by globalization and “five big revolutions” in technology that Georgiadis says are “reimagining the world.” They are mobile devices, video, machine learning, artificial intelligence, and virtual and augmented reality. Instead of online courses, she said, the University has put a priority on experiential learning opportunities – such as internships and hands-on research opportunities – that give students a chance to apply what they’re learning in the classroom to real world challenges. The University has also created an I-zone where students can connect across disciplines to bring their ideas to fruition. The University is also looking at ways new technologies can help enhance classrooms and labs. Flipped classrooms, for example, allow students to watch lectures online, then use classroom time for discussion. Augmented and virtual reality are being explored to simulate lab experiments that might otherwise be too dangerous or cumbersome to perform live. Georgiadis said one of Mattel’s most popular toys last year was a Fischer-Price “Code-A-Pillar,” which introduces basic concepts of coding and sequencing to young children. She offered tantalizing glimpses of how inexpensive chips could be put in Hot Wheels toys to introduce all kinds of variables affecting how fast the toy cars move over the tracks – and thereby introduce basic principles of physics. AI and robotics could transform Barbie dolls to give girls a more realistic opportunity to explore careers in which they are underrepresented, she said.